We're just wild about Lottie Doll! We’re just wild about Lottie Doll! You know that old chestnut, “Should little girls play with Barbie?” – I have to admit, I’ve never felt too strongly either way. There are all kinds of dolls on the market, baby dolls, grown up dolls, dolls that look like rock stars – all of them have pros and cons. But there’s a pretty big hole in the market, and that’s dolls that look like little girls. No longer – she is here, and her name is Lottie. 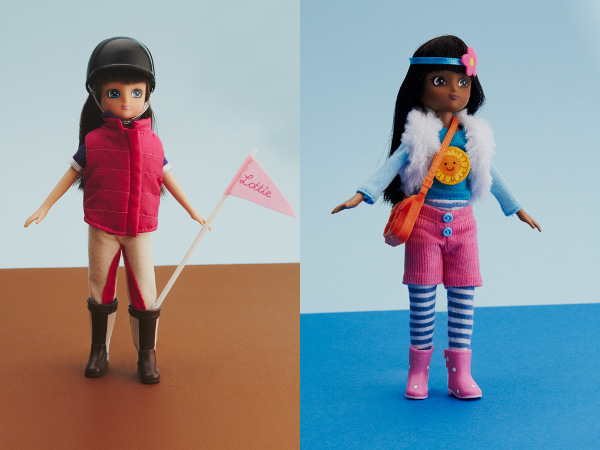 There’s plenty to love about the new Lottie Doll from UK-based Arklu, a toy company who first came to prominence last year when they released the Princess Catherine Engagement Doll. Lottie has been created with some specific values in mind and you can read more about them at Arklu’s Parents’ Page. Core among these is that she has (apart from her quite large head!) the body proportions and shape of a typical nine-year-old girl. She wears fun clothing in lots of different costumes, but it’s all age-appropriate. In fact, her clothing looks a lot like the clothes probably worn by the girls who are playing with her. Something that really stands out about the range is the fact that the clothing and accessories are high quality and well made, with lots of cute and engaging little details. There are currently six different Lottie Dolls in the range, including (among others) a ballerina, a festival-goer, and a pony rider. All of them stand (on their own!) at eighteen centimetres high and have flexible bodies which can be posed in lots of different positions. What’s more – she has non-tangle hair! The range also includes three accessories packs, including a pony accessories set and a pet dog set. You can buy the Lottie Doll in Australia from Women’s Forum Australia. She is just $24.50.